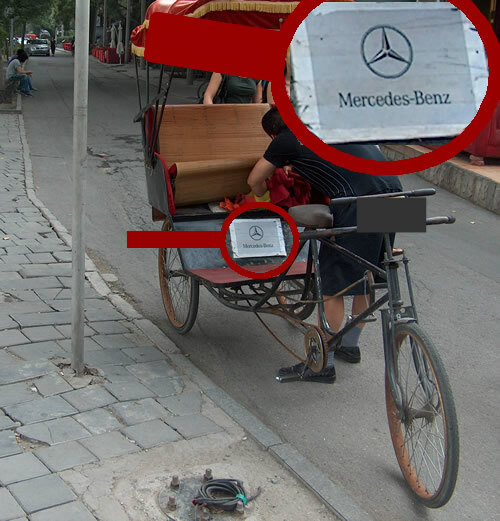 With the presentation of the new “R-Class” (Rickshaw-Class), the first car produced by Daimler exclusively for the Chinese market, the famous company wants to conquer the Chinese automobile market. The new R-Class unites western know-how with traditional Chinese automobile manufacturing. “With the new r-class we will conquer the Chinese market by storm. Our designers created a real Chinese Mercedes for the people, which opens a completely new clientele in the Middle Kingdom”. But recently a reporter managed to take this picture of a first copy of the R-Class in China. Detectives found out, that a company just around the corner produced this copy. Most of the workers of the join-venture actually spent their day shift in the joint venture and their night shift in the company of a certain Mister Wang. Breakfast and dinner are paid by the joint-venture. Like this, the counterfeiter around the corner can safe a lot of costs and can offer the copy of the R-Class with a cheaper price. “This is China. Chinese companies learn fast. The only way to beat those companies is to improve our own product. We already started working on an improved R-Class-2. China Blog by Chinaorbit.com is powered by	WordPress 4.9.10 and delivered to you in 0.374 seconds using 32 queries.